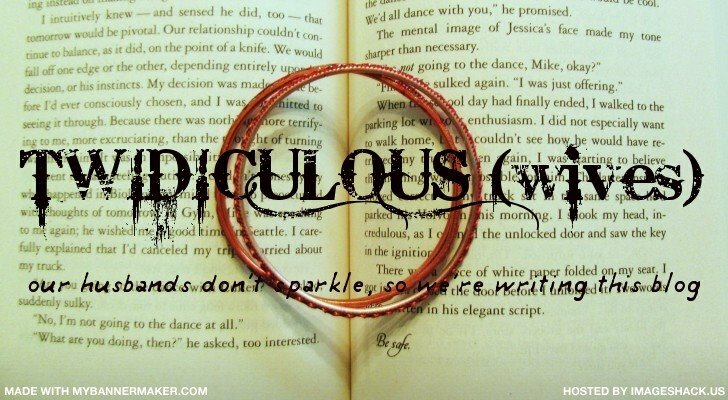 Twidiculous Wives: The Vampire Wears...??? A month ago, I read an article, and I’ve been rolling it over in my head ever since. Basically, the article is an interview with Ashley Greene, where she discusses the fact that New Moon will have a much larger budget than Twilight, and will, therefore, have better clothes. Now, I love the movie Twilight, don’t get me wrong. I LOVE it. But there were definitely some things about it that bugged me. One of those things was some of the characters’ appearances. Stephenie Meyer spent a long time describing her characters and their appearances. She gave a lot of detail. And often, she described specific outfits in a scene. In the movie, the clothes were nothing like what was detailed in the book. Maybe that isn’t a big deal, but it just bothers me…it’s not RIGHT. Why wouldn't you try to get the outfits to resemble the ones from the novels? One of the biggest issues for me was Rosalie. She is supposed to be gorgeous and fashionable, as are all the Cullen's. In the movie, she just did not live up to that expectation. Her clothing was (in my opinion) unflattering and boring. I never once looked at her and thought, “Ooh, I’d love to look like that!” (Shouldn't you want to look like the most beautiful woman on the planet?) Take, for example, her outfit when Bella comes to the house to meet the family. She is wearing skinny jeans, a blazer, heels, and a huge necklace. Surely they could have found something better for her to wear. In the movie, Rosalie just doesn’t strike me as a cutting edge dresser. Her wardrobe was a major disappointment. Her outfits look pretty much the same throughout the film. Why is she always dressed in blazers? It looks outdated to me. Plus, you can really see that they had to cake on Nikki Reed’s makeup to give her that pale-vampire look. She's gorgeous when she's her natural, darker skinned color, but she looks kind of sickly in the film. 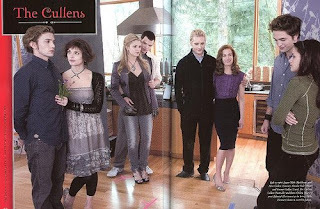 Even worse is Bella’s outfit when she meets the Cullen family. Bella took a lot of time to decide what to wear in the novel, and she ends up choosing a dark blue blouse and a long, khaki-colored skirt. In the movie, she is wearing a green long sleeved t-shirt and brown (corduroy?) pants. Not that this outfit is so horrible in and of itself, but how hard is it to slap on a skirt and a blue top? Especially since SM makes such a big deal about Edward loving Bella in blue. I mean, even with a limited budget, that shouldn’t be a big deal. You could buy that outfit at Wal-Mart! The guys’ outfits were a little better done. Their fitted clothes made them look more custom and stylish. 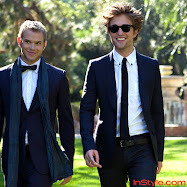 (Of course Rob looked great in everything!) And I thought Esme and Alice both looked pretty good. Alice’s style was pretty boho in Twilight, but it seems that in New Moon she will be more polished. Ashley compares Alice's style in New Moon to Audrey Hepburn’s with some extra attitude. Sounds great to me! From what little I’ve seen of New Moon, I think the larger budget is apparent in the makeup and clothing. Edward and Bella were exactly the same color in Twilight, and while Bella is described as being extremely fair, she should still have more color (remember how much Edward loves to see her blush!) than a vampire. In New Moon, you can see the contrast between Edward and Bella’s skin tones, which I think is nice, and they look so much more natural and healthy. 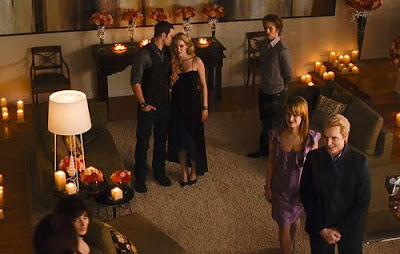 Also, the characters as a whole look so much more stylish in the shots we’ve seen of Bella’s birthday party. THAT is what I wanted to see in Twilight! It's true to SM’s description in the novels. I certainly hope that the outfits and make-up are truly improved in New Moon and the subsequent movies. What do you think? 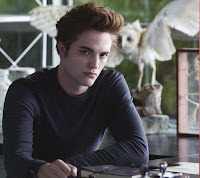 Were the characters what you imagined in Twilight? What clothing did you like or dislike? I'm with you...I wasn't impressed with the wardrobe in Twilight at all. I agree, the guy's was all right. Definitely not the ladies. Alice looks like a grandma and the thing hanging from Rosalie's neck looks like weapon of sorts. Remember that hideous outfit Bella was wearing while washing her truck? Between the boots and the flannel, I was shuddering. Plus, why does everything look green? Weird. I hate that she never wears a freakin blue blouse in the movie. Seriously, how hard is it to find a blue shirt?